As I re-read my eve of 2017 post, its clear that the trepidation coming into 2017, primarily caused by Brexit and Trump’s election, proved unfounded in the short term. In economic terms, stability proved to be the byword in 2017 in terms of inflation, monetary policy and economic growth, resulting in what the Financial Times are calling a “goldilocks year” for markets in 2017 with the S&P500 gaining an impressive 18%. Politically, the madness that is British politics resulted in the June election result and the year ended in a classic European fudge of an agreement on the terms of the Brexit divorce, where everybody seemingly got what they wanted. My anxiety over the possibility of a European populist curveball in 2017 proved unfounded with Emmanuel Macron’s election. Indeed, Germany’s election result has proven a brake on any dramatic federalist push by Macron (again the goldilocks metaphor springs to mind). My prediction that “volatility is likely to be ever present” in US markets as the “realities of governing and the limitations of Trump’s brusque approach becomes apparent” also proved to be misguided – the volatility part not the part about Trump’s brusque approach! According to the fact checkers, Trump made nearly 2,000 false or misleading claims in his first year, that’s an average of over 5 a day! Trump has claimed credit for the amazing performance of the 2017 equity market no less than 85 times (something that may well come back to bite him in the years ahead). 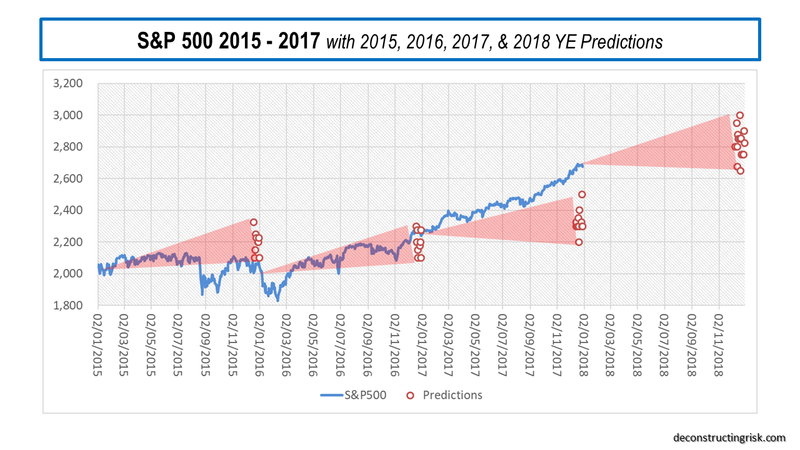 The graph below does show the amazing smooth performance of the S&P500 in 2017 compared to historical analysts’ predictions at the beginning of the year (see this recent post on my views relating to the current valuation of the S&P500). As for the equity market in 2018, I can’t but help think that volatility will make a come-back in a big way. Looking at the near unanimous positive commentators’ predictions for the US equity market, I am struck by a passage from Andrew Lo’s excellent book “Adaptive Markets” (which I am currently reading) which states that “it seems risk-averse investors process the risk of monetary loss with the same circuit they contemplate viscerally disgusting things, while risk-seeking investors process their potential winnings with the same reward circuits used by drugs like cocaine”. Lo further opines that “if financial gain is associated with risky activities, a potentially devastating loop of positive feedback can emerge in the brain from a period of lucky investments”. In a recent example of feeding the loop of positive feedback, Credit Suisse stated that “historically, strong returns tend to be followed by strong returns in the subsequent year”. Let’s party on! With a recent survey of retail investors in the US showing that over 50% are bullish and believe now is a good time to get into equities, it looks like now is a time where positive feedback should be restrained rather than being espoused, as Trump’s mistimed plutocratic policies are currently doing. Add in a new FED chair, Jay Powell, and the rotation of many in the FOMC in 2018 which could result in any restriction on the punch bowl getting a pass in the short term. Continuing the goldilocks theme feeding the loop, many commentators are currently predicting that the 10-year treasury yield wouldn’t even breach 3% in 2018! But hey, what do I know? This party will likely just keep on moving through 2018 before it comes to a messy end in 2019 or even 2020. I am not even going to try to make any predictions about Trump (I’m not that big of a mug). If the Democrats can get their act together in 2018 and capitalize on Trump’s disapproval ratings with sensible policies and candidates, I think they should win back the House in the November mid-terms. But also gaining control of the Senate may be too big an ask, given the number of Trump strong-holds they’ll have to defend. Will a Brexit deal, both the final divorce terms and an outline on trade terms, get the same fudge treatment by October in 2018? Or could it all fall apart with a Conservative implosion and another possible election in the UK? My guess is on the fudge, kicking the can down the transition road seems the best way out for all. I also don’t see a Prime Minster Corbyn, or a Prime Minister Johnson for that matter. In fact, I suspect this time next year Theresa May will still be the UK leader! China will keep on growing (according to official figures anyway), both in economics terms and in global influence, and despite the IMF’s recent warning about a high probability of financial distress, will continue to massage their economy through choppy waters. Despite a likely messy result in the Italian elections in March with the usual subsequent drawn out coalition drama, a return of Silvio Berlusconi on a bandwagon of populist right-wing policies to power is even too pythonesque for today’s reality (image both Trump and Berlusconi on the world stage!). North Korea is the one that scares me the most, so I hope that the consensus that neither side will go there holds. The increasingly hawkish noises from the US security advisors is a worry. Finally, as always, the winner of the World Cup in June will be ……. the bookies! Boom boom. A happy and health New Year to all. This entry was posted in Equity Market, General and tagged 10-year US Treasury, 12 month trailing PE, 2017 review, 2018 FOMC, 2018 predictions, 2018 World Cup winner, Adaptive Markets, Andrew Lo, Brexit, Brexit trade deal, Brexit transition, China financial distress, corporate tax, Credit Suisse, Democrats, Donald Trump, economic growth, economic stimulus, Euro, euro breakup, euro collapse, European disintegration, European elections, European fudge, FED chairman, goldilocks year, happy new year, higher interest rates, inflation, Italian elections, Jay Powell, monetary policy, November mid-term elections, positive feedback, Prime Minister Johnson, Prime Minster Corbyn, punch bowl, rising inflation, risk-averse investors, risk-seeking investors, S&P 500 forecast, S&P 500 prediction, Silvio Berlusconi, stock market volatility, strong dollar, Theresa May. Bookmark the permalink.